Last week at the Cayuga Trails 50 Mile, Dani Filipek won the US 50 Mile National Championships and secured a spot on the 2018 Trail World Championships team. A new face in the sport, having made her ultra debut this year, Filipek sports a speedy marathon PB of 2:41:32 and ran at the 2016 Olympic Marathon Team Trials. The 25-year-old Filipek hails from Michigan and is currently finishing her MBA studies at Walsh College. She also works for Lolë, a women’s leisure, performance, and outerwear company. 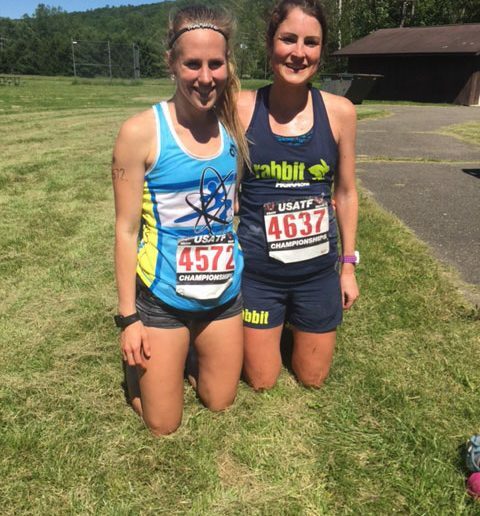 Quick & Dirty: Congratulations on your win at the Cayuga Trails 50 Mile, which was again serving as the US 50M Trail Championships. Before we talk about motivations and your background, can you just take me through the race itself. Did it play out as expected? What were the toughest parts for you and how did you work through them? Dani Filipek: First, I just want to thank Ian Golden, the entire race and volunteer staff of Cayuga Trails 50 Mile, and USA Track & Field. The race was the most beautiful course I have ever run on and truly has given me a spark to follow this crazy ultra dream I have. I thank Ian for giving me the chance to chase that dream and meet some amazing athletes in the sport. This race was a race where I didn’t quite know what to expect. Again, it was truly the most gorgeous and challenging course I have ever ran. It was like a glass of champagne and a shot of whiskey. I knew I did not want to go out like a bat out of hell like I did in Mad City 100K and risk losing all function of my body. I am proud that I was able to hold back and stay within myself. I tried to remember that it’s the longest I have run and to be patient. Enjoying the tough parts was also really big in this race, whether it was a tremendous climb or a trudge through the mud, having fun was really important. As I said, I didn’t expect a course like this, it was like a shocking, good surprise, because honestly, I did a bit of stair and hill work, but not nearly enough for this magnitude. I am excited to fully train for trails since I have primarily trained on roads. I think I have so much room to grow because I was very undertrained for this race and was maybe running 60-70 miles with my longest runs as marathon races (the Hall of Fame Marathon and Stafford Top of Trails Marathon, both great races). We worked on fueling, eating, drinking, and making time to use the bathroom and kind of teaching my marathon brain (no stopping, serious biz with pacing) that it is okay to stop and stopping may actually save you time in the long run. So, I have been holding my peak form since the Mad City, which I was in killer shape for. I was running 30 milers at 7:01/mile pace; 3 x 6 miles at 7 flat, 6:30, and sub-6; and doing 100-plus mile weeks. I didn’t do any workouts but stayed consistent and healthy for Cayuga, which now gives me confidence I can do something big in this sport. Q&D: I saw you briefly before the race, and you looked like someone who was serious and maybe from a road running background, ha. But I didn’t recognize you. Then, sure enough, out on the course, you were cruising in second place. When you came across with the W, I was hanging with my friend Rich Heffron (the Marathon winner) and we were wondering who you were. We saw your Clint Verran Track Club singlet and figured you must have something to do with the Hansons-Brooks Original Distance Project. Can you tell me about your involvement with both of those clubs (Hansons as well as Verran’s club—Clint being a former Hansons runner himself)? Do you still train with the Hansons? DF: I currently run for Brooks Run Influencer Program. Brooks has always supported me from when I ran with the Hansons Brooks ODP program which supports post-collegiate athletes to become some of the world’s best. It was an honor to be on a team with such a legacy and history. I have so much gratitude for the Hanson brothers, their running stores and their running community, because it has given me a great work ethic and passion for the sport. I started working in the Hansons Running Shops and met my All-American, fasty-fast 4:02 miler husband in that store and worked for five years in the run specialty industry. With the Hansons Brooks ODP team I ran my Olympic Trials Qualifier at the Houston Marathon in 2015 with a time of 2:41:32. I still run with the Hanson men and women, and it seems they are always the ones that help me get off the couch to do a second run. They are some of my closest friends and mentors in the sport, especially some of the more experienced runners like Dot McMahan, Mike Morgan, Des Linden, and Clint Verran. I am proudly helping Clint with his new running group, the Clint Verran Track Club. It’s a community place where we can get a great run in and get some brews after, and all are welcome to partake in the fun on Tuesdays. I also want to thank some of the younger Hanson team members, who are some of my closest gal pals, for motivating me to keep chasing these crazy dreams (Jen, Lauren, Carissa, Kelley). 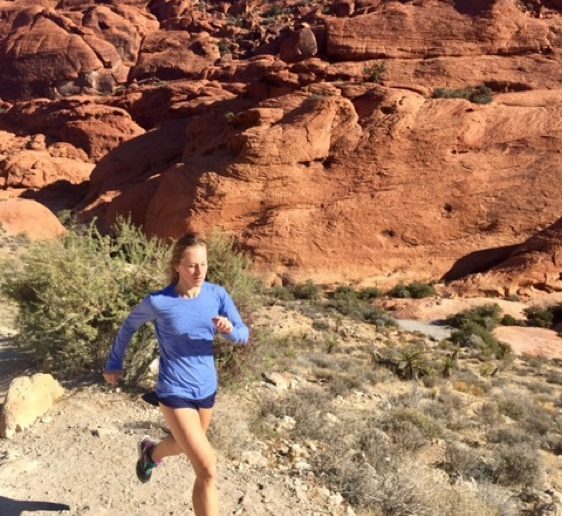 Q&D: Let’s get back to ultrarunning. The sport has seen a bunch of young guys and ladies coming out of college and tearing up the trail and ultra scene in the last year or two. At 25, you seem to fit that mold. I’m curious about your collegiate career and early professional running on the roads. What ultimately motivated your move to ultra distances, especially while you’ve got such speed on the roads? DF: Haha, I told my husband Tony at the start, “I look like I don’t belong here, I look like a road diva in my spandex, sans backpack, glitter Shwings on my shoes, and a sparkly Boho Kitty headband.” I was like you can usually pick an ultrarunner out in a road race, now I am the road warrior who made a wrong turn and ended up on the Yellow Brick Road of Cayuga Trails. I am happy because it really did feel like home during the race—I loved every step, water crossing, hill, mud-pit, and roots (and all the falls and ankle twists that came with them). As far as collegiate running, I was an NCAA D2 All-American at Northwood University in the indoor 5,000 meters, and also a qualifier for the 10,000-meter outdoor championships. I hold three school records at Northwood and won two conference titles in the 5,000 meters (indoor) and 10,000 meters (outdoor). I actually was a bit of a lazeball early on in my career and worked really hard to get back into shape to be a team asset for my squad. I was a late bloomer on the colligate scene. I am proud to be a part of a younger generation of ultra-runners, I really want to make an impact for women runners and see how far I can push myself. I love the atmosphere of ultrarunning, because it’s about so much more than just you as an athlete. It’s about all the people that help. That’s what I love, everyone gets together to help out all these crazy runners (helping for hours and hours, just as long as the runners! ), whether it’s helping you poor pickle juice down your throat or giving you the gloves off their hands. This sport is the friendliest, most supporting environment anyone can be a part of. I feel like I’m home as an ultrarunner. Q&D: Being based just north of Detroit, in Rochester Hills, I can’t imagine you have too many hills to train on. How were you able to train specifically for Cayuga Trails (if at all), which has around 9,000 feet of climbing? And do you anticipate racing more ultras with a lot of vertical? After all, with your win at Cayuga, you secured a spot on Team USA for the 2018 Trail World Championships, which are going to take place in a mountainous area north of Valencia. DF: There is one hill called Dutton Hill. It has three levels and is the most feared out of all the hills in Rochester. Honestly, Michigan is such a great running place because we have a little bit of everything surface wise; between the flat and fast Paint Creek Trail, Stoney Creek Metro Park (solid pavement, marked every 400 loop), and the hills starting at Rochester looping to the 7 Sisters of Lake Orion (hills on hills). I feel like it was just enough to survive, but I know I need to work on my downhill. Trust me, my quads are screaming at me to work on that! I am so honored to represent Team USA at the 2018 Trail World Championships in Valencia, Spain. It is a dream come true, and I thank my family, friends, and running community for the support in this running journey. I feel so blessed and grateful at this opportunity and will train to be in contention with some of the world’s best. Q&D: You also ran at the Mad City 100K in Madison, Wisconsin, which was this year’s US 100K Road Championships. I understand that you raced aggressively, splitting 3:31 for 50k, but that the race didn’t quite go to plan. Can you tell me a bit about what happened there? And are the road ultras—and in particular the 100k distance and the 2018 IAU 100K World Championships—still something that interest you going forward? DF: At the Mad City 100k, I had some fueling issues, got too greedy, and didn’t understand the distance. My kidneys failed, and I was taken to the hospital a hop-skip and a jump before the 50 mile mark, so this National Championship [at Cayuga Trails]was my redemption. Though I hope to come back and get my redemption in the 100k. I’ve now learned some really valuable information from the amazing people in this sport, and I also learned my lesson the hard way [at Mad City]. Q&D: Awesome. Congratulations again on your win last weekend. I’m excited to follow you as you embark on your ultrarunning career! Dani Filipek runs for the Brooks Run Influencer Program and Clint Verran Track Club. You can follow her on Twitter and Instagram (@rundanirun9).